Mobashar Jawad Akbar's Sunday and Pritish Nandy’s Illustrated Weekly of India defined much of Indian journalism in English in the 1980s. The post-Emergency (1975-1977) renaissance in Indian journalism in English that ushered in the in-your-face journalism is really the gift of these two Bengali journalists. It’s really unfortunate that Sunday and the Weekly did not survive in the marketplace of ideas. This was because both the editors were larger-than-life, and become bigger than their magazines. If Bennett Coleman & Company (publishers of the Times of India) redefined the media by turning newspapers into brands, these two editors turned themselves into brands. One of the regulars at both these magazines was Tariq Ali, the firebrand Leftist. Ali had a refreshing style, and a controversial point of view, on every subject that he never hesitated to express. Moreover, his views were relevant then because the world hadn’t yet heard of perestroika and glasnost. Mikhail Gorbachev had yet to take centre stage in Kremlin and sweep away the cobwebs of communist shibboleths. Ali’s Street Fighting Years: An Autobiography of the Sixties was published in the mid-1980s, and became an instant success in India. Around the same time Akbar’s India: The Siege Within was also published. Street Fighting Years was (and remains) a fantastic glimpse of the 1960s – the decade that changed the course of social (and political?) history in the West. For me, it was a one-volume introduction to the turmoil and the excitement that rocked the world and changed it forever. It was in this book that I read – in great details – the heroism of Che Guvevara. The story of the brave revolutionary who did not rest after the regime change in Cuba, but wanted to bring about revolutions in other parts of the world. I can think of only two leaders in 20th century history -- Mahatma Gandhi and Che Guvevara -- who were not satisfied with comprehensive victories in achieving their mission, but were more interested in contunuing the struggle. The book was pure nostalgia. But it provided a deeper political and social understanding to the era that is even now viewed merely from the Woodstock and Vietnam perspective. 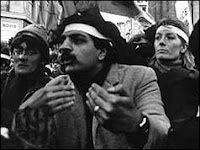 Tariq Ali is an industry today, and much of what he says and does really seems quite quaint. For instance, not too many people will share Ali’s enthusiasm for Hugo Chavez, even if most would agree with his contention that the West has replaced Islam with Communism. For understanding the 1960s, there's no better book than Street Fighting Years.